The offshore racing in the Irish Sea just gets better and by working in partnership with our supporting clubs a great series of races has been designed for 2015 providing racing for everyone’s taste. We have shorter offshore day and night races on both sides of the Irish Sea. 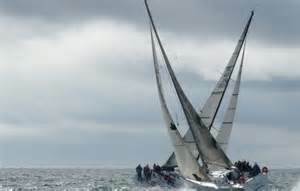 A series of traditional ISORA races and we have also combined with classic races including the Liverpool Yacht Club Lyver Trophy race, in association with Royal Dee Yacht Club and RORC, and the D2D Dún Laoghaire to Dingle 270 mile race. All races are standalone races with good competition for IRC Class 1 and Class 2 boats. We also cater for the cruiser yachts in the keenly contested Silver Fleet and for the brave a two handed class. These races all count towards the overall series championships in IRC Class 1 and 2; in the Silver Fleet and the two handed class; in the coastal series and, of course, the prestigious Overall win for the Wolf’s Head Trophy. Careful consideration has been given to the 2015 ISORA race programme so that boats can also compete in the ICRA Championship, the Volvo Dún Laoghaire Regatta and the Spinlock IRC Welsh National Championship in Pwllheli. The offshore sailing highlight for 2015 is the ‘Royal Dee Irish Sea Offshore Racing Championship’ to coincide with the Royal Dee Yacht Club’s 200 years celebrations. This event combines with the Volvo Dún Laoghaire Regatta (VDLR) and the classic Lyver Trophy Race from Holyhead which is also the feeder for the VDLR. Racing starts with the first coastal races, on both sides of the Irish Sea, on 25th April and the first qualifying race is on 25th May. We will visit the Isle of Man again this year, where we are promised a great welcome, and we have also scheduled a dual race from Pwllheli and Dún Laoghaire both finishing in Greystones.